South Pacific Familyadventure 2008 - The crew:Olle Tingstam,here with his father onboard their family yacht, Ikarus.Caledonian Canal July 2005(picture). 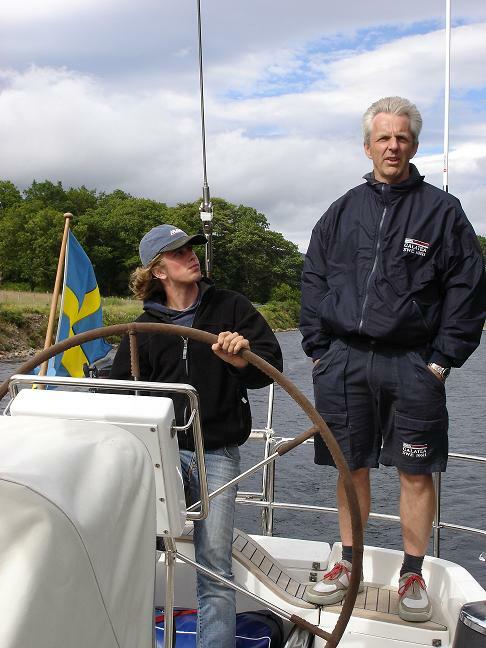 Title: The crew:Olle Tingstam,here with his father onboard their family yacht, Ikarus.Caledonian Canal July 2005(picture). Olle Tingstam grew up in a family passionate for sailing.Olle´s father Klas,and Claes met crewing different Scandinavian doubleenders,in Lisbon 1980(that´s a long and different story).Olle has participated onboard their family yacht( Ikarus) on different cruises since several years back,among others from the Mediterranean to Sweden,and in the Classic Malts Cruise 2005.He has now finished high school,and has the desire for travelling before aiming for a professional career.Olle will embark in Curacao,sail over the San Blas-Panama,and finally disembark on the Galapagos.He is the ships computer expert.